Today, comScore released a study on U.S. smartphone behavior with respect to retail and shopping. The study found that 4 in every 5 smartphone users, which represents 85.9 million U.S. users, accessed retail content on their device in July. Amazon was the top retailer with an audience of 49.6 million visitors, followed by eBay with (32.6 million visitors) Apple (17.7 million visitors), Wal-Mart (16.3 million visitors), Target (10 million visitors) and Best Buy (7.2 million visitors). Beyond traditional retailers, Ticketmaster attracted 5.7 million visitors as summer concerts and performances saw fans turn to their smartphones for tickets and information. Home Depot (4.4 million visitors) and competitor Lowes (3.2 million visitors) also saw traffic. Location-based shopping rewards app Shopkick saw its mobile audience reach more than 4 million visitors in July, according to comScore. Among both iPhone and Android users, Amazon ranked as the top retailer with a reach of 43 percent among iPhone users and 55 percent among Android users, with visitation to the Amazon Appstore largely accounting for the higher reach among Android users. In contrast, Apple saw 33.5 percent reach among iPhone owners compared to 7.3 percent among Android users. 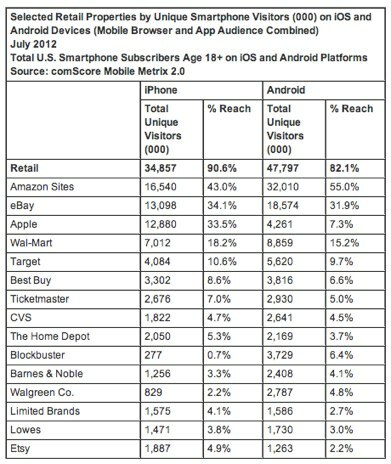 Among the majority of the selected retailers, comScore reports that the iPhone had a higher penetration compared to Android, while in most cases Android devices delivered a larger audience due to the platform’s higher overall market penetration. comScore also broke down the demographics of mobile shoppers. 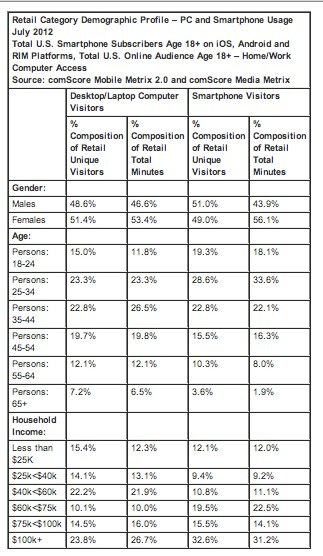 Across both smartphones and desktop computers, males and females represented nearly equal proportions of retail category visitors. However, females accounted for a higher share of time spent on retail destinations at 53.4 percent of minutes on desktop computers and an even greater share of retail minutes on smartphones at 56.1 percent. Smartphone shoppers were also more likely to be younger than their desktop counterparts with 70.7 percent of smartphone retail visitors under the age of 45 compared to 61.1 percent of desktop users. Engagement among these audiences showed even greater disparity with visitors under the age of 45 accounting for nearly 3 in every 4 minutes spent on retail content via smartphones, compared to 61.6 percent of retail minutes on desktop computers. Among smartphone audiences accessing retail destinations, nearly 1 in every 3 had a household income of $100,000 or greater, with this income segment driving a comparable 31.2 percent of minutes spent on retail sites and apps.